Feb. 5, 2013 – The next time you are having a bad day, think of the life of Rosa Parks. Then summon the courage to go on; stand tall for your convictions; and most important, act on your convictions with that courage to make the world a better place for everyone. That was the message at yesterday’s Rosa Parks National Day of Courage at The Henry Ford in Dearborn, Michigan. 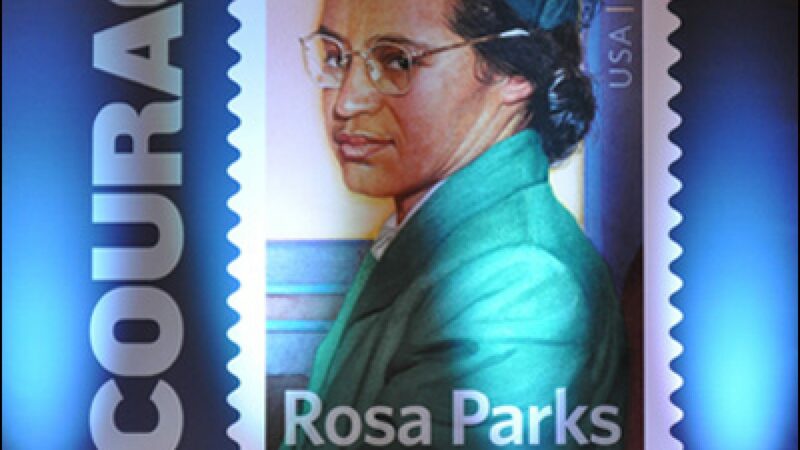 AND there is one more thing you can do – purchase the new Rosa Parks Forever stamp, unveiled yesterday morning as part of the Rosa Parks National Day of Courage celebration, held on the centennial of the birth of Rosa Parks (1913-2005). On December 1, 1955, Rosa Parks refused to give up her seat to a white passenger on a Montgomery, Alabama city bus after being directed to do so by the bus driver. Rosa was abiding by the rules and sitting in the middle section behind the sign for African Americans. She decided she would not move. It wasn’t because she was tired after a long day of work but a determination to stand tall for her convictions. That single act of peaceful defiance against segregation was the spark that ignited a large scale bus boycott that lasted just over one year. In November 1956, the Supreme Court ruled that segregating people on public buses was unconstitutional. The story of Rosa Parks, the bus, and the Civil Rights Movement was told throughout the day yesterday by historians, journalists, politicians who worked with Rosa Parks, and officials at The Henry Ford who acquired the Montgomery city bus in 2001. The story of the bus was especially Word of the Day captivating. Steven Hamp, trustee and former president of The Henry Ford, and Patricia Mooradian, president of The Henry Ford, were both involved in the acquisition. Steven Hamp explained that the acquisition began in August 2001 when they saw an article in the Wall Street Journal that included a picture of an old, dilapidated bus with the headline – Could this be the Rosa Parks bus? Officials at The Henry Ford had already decided they wanted to obtain an iconic artifact from the Civil Rights Movement and were immediately interested. But first they needed the provenance to prove it was actually the bus on which Rosa Parks sat on December 1, 1955. From their research they learned that the old bus had been purchased in 1971 by a man who actually purchased two buses to use as storage sheds for tools. He had told his daughter that one of the buses was the Rosa Parks bus. After he died, his daughter and son-in-law decided to sell the Rosa Parks bus on eBay. It was offered for $10,000 but nobody bid on it. More proof was needed that it was THE Rosa Parks bus. Hamp said the break came when old scrapbooks owned by a bus dispatcher were found. Because the Rosa Parks incident generated many newspaper articles, a bus dispatcher clipped out a series of articles for a scrapbook. In the margins, he wrote in pencil the number of the bus – 2857 with his name – James Blake. That was the proof they needed. This time the bus went on the traditional auction block. By noon on the day of the auction, the bid climbed to $60,000 because many bidders were interested in the bus. By midnight, the bid was up to $400,000. At 3 a.m., the last bidder dropped out and The Henry Ford acquired the bus for $427,000. In addition, they purchased the scrapbooks. Patricia Mooradian said their cell phones were buzzing in the middle of the night. On December 1, 2001, Rosa Parks, a resident of Detroit after moving there in 1957, came to The Henry Ford and saw the bus, now without seats and in very poor condition, according to Hamp. The decision to restore the bus was made after much debate but ultimately, museum officials decided it should be restored and open to the public. After 18 months of work, the bus returned to The Henry Ford, with original seats found from other city buses of the same model, in time for Black History Month in 2003. In 2006, the bus became part of the permanent exhibit – With Liberty and Justice for All. “It is the most important artifact of the 20th century regarding the Civil Rights Movement,” Hamp said. Yesterday, people waited in a long line for the chance to sit on the bus – # 2857 – now gleaming in bright green and yellow, the iconic artifact of the Civil Rights Movement. Restoration costs were about $500,000, according to Hamp. Douglas Brinkley, author of “Rosa Parks: A Life,” spoke in the afternoon. He wanted the audience to know a few things about Rosa Parks. First and foremost, Brinkley said Rosa Parks stressed she was not just African American but an American with Scottish-Irish and Cherokee Indian ancestors. The Civil Rights Movement was a movement for everyone. Second, Brinkley said she was devoted to Christ and her church, attending church every Sunday. Third, although she did not have children, she had a deep love for children. Fourth, she loved Booker T. Washington, an African American educator who built industrial schools, for boys and girls, in the South. Fifth, in her later life, she studied the underground railroad. Sixth, she had a deep friendship with Dr. Martin Luther King Jr. and admired his ability to resist violence even after being punched in the face. Rosa was with King in Birmingham in the 1960s when he was punched in the face. Rosa gave him aspirin and a soft drink, indignant at the violence against King. “She was not passive,” Brinkley said. Seventh, she loved her husband Raymond who was also an activist. Rosa included him in her work and achievements, Brinkley explained. “Her heart knew no bounds for the love she had for all of us,” Brinkley said as he concluded his remarks at the Rosa Parks National Day of Courage. Whether your day is going as hoped or not, think of Rosa Parks and her message of love and unity with fierce determination to take a stand. Go the extra mile to show the courage of your convictions. And when you need a booster shot of courage, visit the bus at The Henry Ford or buy a Rosa Parks Forever stamp, both tangible reminders of that courage. “One person, through character, conviction, and strength, can change the world,” Senator Carl Levin, (D-Mich), said at the Rosa Parks National Day of Courage.